Matthew "Matt" Guido DiBenedetto (born July 27, 1991) is an Italian-American professional stock car racing driver. He currently competes full-time in the Monster Energy NASCAR Cup Series, driving the No. 95 Toyota Camry for Leavine Family Racing. DiBenedetto first showed an interest in auto racing after receiving his little league trophy around age 8. His father, Tony, who raced an Opel Manta in SCCA and IMSA in the late 1970s and early 1980s, noticed he preferred watching automobile racing on television over baseball. DiBenedetto's father knew that another player on his son's little league team was competing in mini kart racing so he bought him a used kart which a young DiBenedetto drove to his first victory. He later moved up to the UARA-Stars series, racing late models. DiBenedetto made his NASCAR Nationwide Series debut in 2009 at the Memphis Motorsports Park and drove the No. 20 Pizza Ranch Toyota for Joe Gibbs Racing. DiBenedetto raced part-time in the No. 20 car in 2010. His first race of 2010 came at the night race for the Nationwide Series from Tennessee. He was solid the whole night and had a top 10 performance in 10th. His next race came at Road America. While running 11th he had an axle problem due to running over the curbs too hard, and that led to him falling many laps down. DiBenedetto ran six races for Joe Gibbs in 2010, with two top ten finishes. After being forced out of K&N Pro Series East team X Team Racing due to lack of sponsorship, DiBenedetto then joined The Motorsports Group midway through 2012 and ran as a start and park driver for 7 races finishing 79th in points. In 2013, DiBenedetto joined Vision Racing to drive the No. 37 car part-time in the Nationwide Series and also started and parked the few races he was in. Dibenedetto later looked back at the start-and-park time as valuable for the seat time it gave him, which paid off later in his career. During the 2014 season's Subway Firecracker 250 at Daytona, DiBenedetto replaced Jeffrey Earnhardt in the No. 4 JD Motorsports Chevy during the first caution due to Earnhardt suffering a fractured collarbone in a motorcycle accident during the week. For the second race he joined the Motorsports Group, where he start-and-parked the No. 46 Chevrolet for 12 races and raced the rest with the No. 40. He scored two top-15 place finishes at Road America and Mid-Ohio. DiBenedetto finished a career high 21st in points. In 2016, he made his return in the Xfinity Series driving the No. 10 Camry for TriStar Motorsports at Fontana, where he started 33rd and finished 40th after starting and parking. At the Fall Texas race he crashed into the outside wall in turn 4 ending in a concussion and not racing in the Cup race the following day. DiBenedetto moved up to the Sprint Cup Series in 2015. He was originally intended to drive the No. 83 Dustless Blasting and No. 93 Toyotas for BK Racing on a part-time basis; he split the No. 83 during the year with Camping World Truck Series driver Johnny Sauter. After Sauter drove the No. 83 in the Daytona 500, DiBenedetto failed to qualify in his first two attempts at Atlanta and Las Vegas before finally qualifying for his Sprint Cup debut at Phoenix. With Sauter eventually decided not to race at any other Cup race after the Daytona 500, DiBenedetto took over the No. 83 full-time and declared for ROTY contention. At Martinsville Speedway during a practice session, DiBenedetto was involved in an incident with three-time NASCAR champion Tony Stewart. The incident occurred when DiBenedetto tried to merge on the track behind Carl Edwards and the gap closed ahead of him. With Stewart fast approaching down the backstretch, DiBenedetto moved up the track in turn three to let Stewart pass. "When I got to (turn) three I didn't want to hold him up, so I just pulled up high and let him go by," DiBenedetto told Foxsports.com. "I got completely out of his way, but that wasn't enough. He tried to wreck me a few times, brake-checking me and flipping me off around the whole track." After the incident, DiBenedetto called Stewart "an arrogant prick". DiBenedetto returned full-time with BK Racing in 2016, though he ran the No. 93 for the Daytona 500 since Michael Waltrip was in the No. 83 for the race. At Daytona, DiBenedetto crashed with Chris Buescher on lap 92 in what Buescher called the "hardest hit of his career", though the two were not injured. In the Food City 500 at Bristol Motor Speedway, DiBenedetto finished a career-best sixth place, his first career top ten and the first for BK Racing since Travis Kvapil's eighth-place finish at the 2012 Good Sam Roadside Assistance 500 at Talladega Superspeedway. He returned to the No. 93 for the Federated Auto Parts 400 at Richmond while Dylan Lupton drove the No. 83, while also driving the No. 93 at Talladega's Hellmann's 500 as Jeffrey Earnhardt was in the No. 83. DiBenedetto missed the AAA Texas 500 after suffering a concussion during the previous day's Xfinity Series race and was replaced by Earnhardt. He was cleared to return at the following race in Phoenix. For the season-ending Ford EcoBoost 400 at Homestead, he drove the No. 49 to promote the video game NASCAR Heat Evolution's price change to $49.99. On December 8, 2016, DiBenedetto announced he had parted ways with BK Racing. Two days later he announced that he would drive a single-car effort for Go Fas Racing in 2017. Go Fas is one of the charter teams and as a result, DiBenedetto would make every race in the No. 32 Go Fas Racing Ford Fusion. In the 2017 Daytona 500, his first for Go Fas, DiBenedetto finished 9th for his second career top 10. Statistically, DiBenedetto has been Go Fas Racing's best driver since co-owner Frank Stoddard founding the team in 2011, with him picking up several top twenty and top thirty finishes. DiBenedetto had a great race in the 2017 Food City 500 when he picked up a top twenty finish, his best finish since Daytona. At the Monster Energy Open leading up to the All-Star Race, DiBenedetto drove a Reddit-sponsored car; he learned of the site when driver Josh Wise was voted into the 2014 All-Star Race by the community, who nearly voted DiBenedetto into the 2016 race. The community then repeated their near-feat by having another close call in the 2017 Monster Energy NASCAR All-Star Race. After the campaign, DiBenedetto remained an active member of the community, interacting with its users in the NASCAR subreddit on a regular basis. At the 2017 Brickyard 400, DiBenedetto qualified near the back of the field. Despite this, he managed to avoid the late-race melee to pick up another top ten finish for the No. 32, finishing 8th. Soon after the race, DiBenedetto, crew chief Gene Nead, and Go Fas extended their contract to the 2018 season, allowing DiBenedetto to remain in the No. 32 for 2018. However, Nead left for personal reasons in late February. Before the spring ISM race, DiBenedetto reached out on Twitter that his team has no sponsors for that race and needed a last-minute sponsor. Denny Hamlin, Kevin Harvick and Darrell Waltrip began to donate money to fund a sponsor, and the team later received Zynga Poker sponsorship. Go Fas eventually launched #TeamBurrito, a program that allows fans to encourage businesses to sponsor the No. 32 car in exchange for various rewards. Later that season, in July, at Daytona, DiBenedetto drove the No. 32 Zynga Poker Ford Fusion to another top ten finish, this time 7th, for the team's best finish. On September 7, 2018, DiBenedetto announced that he will not be returning to Go Fas Racing in 2019. On October 10, it was announced that DiBenedetto signed a two-year contract with Leavine Family Racing to drive the No. 95 Toyota Camry starting in 2019. In his first race with Leavine Family Racing, DiBenedetto nearly pulled off the victory at the 2019 Daytona 500. DiBenedetto took the lead mid-way in the race and led a race-high 49 laps before being collected in the Big One with less than 15 laps to go. DiBenedetto was born in Nevada City, California but raised in Grass Valley, California to parents Sandy and Tony DiBenedetto. He has three siblings, Austin, Katie, Kelley. Austin is a member of the United States Air Force. In 2015, DiBenedetto married his childhood friend Taylor Carswell. They currently reside in Hickory, North Carolina. ^ a b Gluck, Jeff (April 17, 2016). "Gluck: Matt DiBenedetto writes fairy tale with sixth place at Bristol". USA Today. Retrieved April 17, 2016. ^ "NASCAR podcast: Matt 'Guido' DiBenedetto". Racer. 2018-05-03. Retrieved 2018-05-03. ^ Wolkin, Joseph (April 21, 2013). "Matt Dibenedetto to Return to NASCAR Nationwide Series with Vision Racing". Rant Sports. Retrieved 2013-08-24. ^ Ryan, Nate (2018-04-26). "Ep. 135: Matt DiBenedetto". ART19. Retrieved 2018-05-08. ^ Eddinger, Mark (July 4, 2014). "Dakoda Armstrong Wins Pole as Downpour Causes 7-Car Crash in Round 1 of Nationwide Qualifying at Daytona". Sports Media 101. Retrieved 2014-07-04. ^ Spencer, Lee (March 27, 2015). "Dibenedetto: Stewart has anger issues". Motorsport. Retrieved May 24, 2015. ^ Pockrass, Bob (February 5, 2016). "Michael Waltrip to race in Daytona 500 for BK Racing". ESPN. Retrieved February 5, 2016. ^ Olson, Jeff (February 21, 2016). "Chris Buescher, Matt DiBenedetto endure hard collision at Daytona 500". USA Today. Retrieved April 17, 2016. ^ Menzer, Joe (April 17, 2016). "Career-best finish leaves Matt DiBenedetto emotional after Bristol". Foxsports.com. Retrieved April 18, 2016. ^ "E.J. Wade Construction Returns to Sponsor Matt DiBenedetto, Dylan Lupton at Richmond". BK Racing. September 1, 2016. Retrieved September 1, 2016. ^ "Talladega Entry List". Jayski's Silly Season Site. Retrieved October 17, 2016. ^ "JEFFREY EARNHARDT TO DRIVE FOR BK RACING AT TALLADEGA". NASCAR. October 17, 2016. Retrieved October 17, 2016. ^ Pockrass, Bob (November 5, 2016). "Matt DiBenedetto in concussion protocol, out of Sunday's race". ESPN. Retrieved November 5, 2016. ^ "Matt DiBenedetto out with concussion; Jeffrey Earnhardt called in as replacement". Sporting News. November 6, 2016. Retrieved November 6, 2016. ^ "DIBENEDETTO SAYS HE IS 'CLEARED TO RACE THIS WEEKEND'". NASCAR. November 8, 2016. Retrieved November 11, 2016. ^ "$49.99 NASCAR Heat Evolution Joins BK Racing, Matt DiBenedetto for Homestead" (Press release). BK Racing. November 11, 2016. Archived from the original on November 11, 2016. Retrieved November 11, 2016. ^ McFadin, Daniel (December 8, 2016). "Matt DiBenedetto not returning to BK Racing in 2017". NBC Sports. Retrieved December 8, 2016. ^ Staff report (December 15, 2016). "DiBenedetto Joins Go Fas Racing for 2017 Season". NASCAR.com. Turner Sports Network. Retrieved December 15, 2016. ^ "DIBENEDETTO, GO FAS RACING TO REP REDDIT AT ALL-STAR WEEKEND". NASCAR. May 8, 2017. Retrieved May 8, 2017. ^ "Matt DiBenedetto returning to Go Fas Racing for 2018 season". NASCAR. August 12, 2017. Retrieved September 6, 2017. ^ "Go Fas Racing announce new crew chief, Randy Cox for the 32 team". NBC Sports. February 27, 2018. Retrieved April 4, 2018. ^ Errington, Tom (March 8, 2018). "DiBenedetto gains sponsorship for Phoenix race weekend". Motorsport.com. Retrieved April 4, 2018. ^ Nguyen, Justin (March 23, 2018). "Matt DiBenedetto and Go Fas thinking outside the box with sponsorship". The Checkered Flag. Retrieved April 4, 2018. ^ "Leavine Family Racing hires DiBenedetto to drive the No. 95 Toyota". Jayski's Silly Season Site. ESPN. October 10, 2018. Retrieved October 10, 2018. ^ Martin, Bruce (February 17, 2019). "Matt DiBenedetto is NASCAR heartbreak story of 2019 Daytona 500". Autoweek. Retrieved February 25, 2019. ^ "New Car, New Driver, Same Partners - NASCAR 2019". Procore Corporate Blog. 2019-02-04. Retrieved 2019-04-12. ^ "Matt DiBenedetto – 2015 NASCAR Sprint Cup Series Results". Racing-Reference. Retrieved November 18, 2018. ^ "Matt DiBenedetto – 2016 NASCAR Sprint Cup Series Results". Racing-Reference. Retrieved November 18, 2018. ^ "Matt DiBenedetto – 2017 Monster Energy NASCAR Cup Series Results". Racing-Reference. Retrieved November 18, 2018. ^ "Matt DiBenedetto – 2018 Monster Energy NASCAR Cup Series Results". Racing-Reference. Retrieved February 7, 2019. ^ "Matt DiBenedetto – 2019 Monster Energy NASCAR Cup Series Results". Racing-Reference. Retrieved February 17, 2019. ^ "Matt DiBenedetto – 2009 NASCAR Nationwide Series Results". Racing-Reference. Retrieved November 18, 2018. ^ "Matt DiBenedetto – 2010 NASCAR Nationwide Series Results". Racing-Reference. Retrieved November 18, 2018. ^ "Matt DiBenedetto – 2012 NASCAR Nationwide Series Results". Racing-Reference. Retrieved November 18, 2018. ^ "Matt DiBenedetto – 2013 NASCAR Nationwide Series Results". Racing-Reference. Retrieved November 18, 2018. ^ "Matt DiBenedetto – 2014 NASCAR Nationwide Series Results". Racing-Reference. Retrieved November 18, 2018. ^ "Matt DiBenedetto – 2016 NASCAR Xfinity Series Results". Racing-Reference. Retrieved November 18, 2018. ^ "Matt DiBenedetto – 2009 NASCAR Camping World East Series Results". Racing-Reference. Retrieved March 1, 2018. ^ "Matt DiBenedetto – 2011 NASCAR K&N Pro Series East Results". Racing-Reference. Retrieved March 1, 2018. ^ "Matt DiBenedetto – 2012 NASCAR K&N Pro Series East Results". Racing-Reference. Retrieved March 1, 2018. ^ "Matt DiBenedetto – 2011 ARCA Racing Series Results". Racing-Reference. Retrieved November 18, 2018. 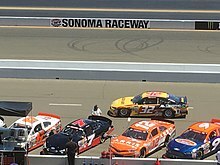 Wikimedia Commons has media related to Matt DiBenedetto.